Fatal crash at Sandy Beach: A woman died in a three vehicle crash at Sandy Beach this morning. UPDATE 10AM: CRASH scene investigators have made their way to the scene of a fatal accident at Sandy Beach. 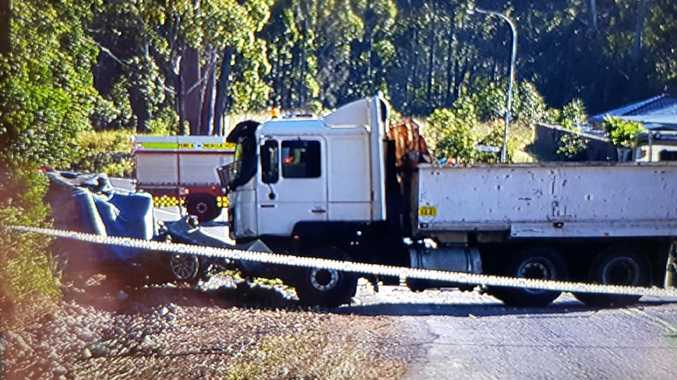 A female driver died after a truck and two other vehicles became involved in a collision on Solitary Islands Way near the Holloway's Rd intersection around 7.50am. Ambulance media have confirmed three patients were transported to Coffs Harbour Base Hospital with minor injuries. All three patients were reported to be in a stable condition and will undergo mandatory testing. On arrival, officers located a crash involving a truck and two cars. A woman in one of the cars died at the scene, police said. The other drivers and passengers were released from the crashed vehicles. All were treated at the scene by NSW Ambulance paramedics for minor injuries and taken to Coffs Harbour hospital for treatment. The drivers of the truck and the other car will undergo mandatory blood and urine testing. Crash Investigation Unit officers and heavy vehicle inspectors are en-route to investigate the circumstances surrounding the crash. Motorists are advised that Solitary Island Way is blocked in both directions at the crash site and are advised to avoid the area.